Freaky Ali is painfully dull, warns Sukanya Verma. 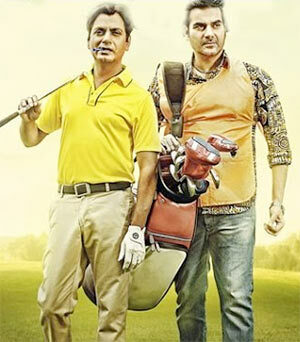 At some point in Freaky Ali, its titular hero Nawazuddin Siddiqui and his snooty golf rival Jas Arora clash over their economic difference in lines that reek of an era dusted and done with. Straightaway sensing how dated the ameer versus gareeb squabble sounds in the current scenario, Nawaz mocks it in a hushed, self-parodical tone. If only Sohail Khan’s exercise in stereotypes would facetiously scoff at Freaky Ali’s farce more often, its adherence to all tried and tested elements would be a lot less tedious. Although it takes obvious inspiration from Adam Sandler’s Happy Gilmore, the pedestrian comedy sticks to worn-out Bollywood clichés like Amitabh Bachchan-styled basti orphan praying out loud inside places of worship, a voluntary mother recalling Nirupa Roy, the duo’s textbook affection signifying religious secularism and, not to forget, reasserting the power of good luck charms -- be it the trusty talisman or Freaky Ali’s mommy-knitted miracle sweater. It also aspires to channel the Munna-Circuit tapori camaraderie of Munnabhai MBBS except puffy hafta collector Arbaaz Khan proves to be a dour, drab sidekick. A sub-plot involving his brawny, blockheaded boss (Nikitin Dheer) and his blundering cohorts adds to the cacophony. Under any circumstances, the uniqueness of Nawaz playing hero in a slightly more mainstream skin doesn’t hold up around Freaky Ali’s clumsy wit or contrived romance track with a blank Amy Jackson. It’s strange to watch Nawaz and Seema Biswas (as his adoptive Ma), two of art-house cinema’s biggest breakout stars in recent times, articulating corny sentiment in poorly composed scenes when their calibre deserves a far better platform. As dazzling Nawaz is in shutting up his highbrow opponent (Jas Arora, all fuzz no fury), the writing itself is too daft and phony to tickle. It's puzzling why Arora’s character is initially depicted as some kind of a senior, retired golf champion, giving away prizes to players only to haughtily compete with the same bunch in tournaments to follow. As always, lack of insight troubles Sohail Khan’s latest feature too. He pitches the class disparity concerning novice Nawaz and five-time champion Jas Arora to extract predictable, overblown conflict but fails to recognise the potential for commentary in elitist monopolisation of certain sports. Or something along the lines of Mansoor Khan who captured this smug entitlement perfectly in Rajput versus Model rivalry in the delightful sportsmanship of Jo Jeeta Wohi Sikandar. Golf is a serene sport. On screen, a game about focus and patience isn’t always very exciting to watch and Freaky Ali doesn’t even pretend like it wants to enthuse forget educate except equating it with cricket for analogical purposes. It’s entirely on the writers and actors to make the proceedings seem crucial or comic. What shows up on screen is plain lazy on their part and it's painfully dull to watch.